On our last full day of vacation, we chose to climb Humphreys Peak, the Arizona high point. The summit lies at an elevation of 12633'. Leesa was a little apprehensive about the hike because some trip reports that we read talked about the difficulty of the final push to the top. They made it sound somewhat technical and she didn't want that. We decided we would try it, and if it was more difficult than she was comfortable with, I would push on to the summit and meet her back down at the car. The weather was perfect with temperatures in the mid 40's and a high expected temp of about 70. Sunshine was predicted for the whole day. 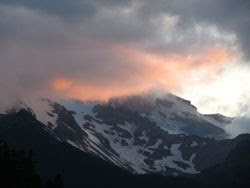 We camped near the Arizona Snowbowl and were at the trailhead and on the trail at 6:30. We were the 2nd group to sign in for the day. It turns out that the first 2 guys that signed in started at 2 AM because they wanted to see sunrise from the summit. Unfortunately, even though they reached the summit before daybreak, it was foggy at first light and they weren't treated to the sunrise display they were hoping for. Plus the temps were around freezing on the summit at daybreak and they got quite chilled waiting for morning light. As we had experienced with other trails in this area, the trail conditions were much better than we are used to in the Adirondack mountains of NY. Footing was generally good, and the soil is much drier. This hike is 9.6 miles roundtrip and reports said to allow a minimum of 6 hours to complete the hike. There were also warnings that if there were indications of bad weather, be sure to head down ASAP. The trail we took starts at the Arizona Snowbowl (elev. 9300') and immediately crosses a ski trail and heads into the woods. 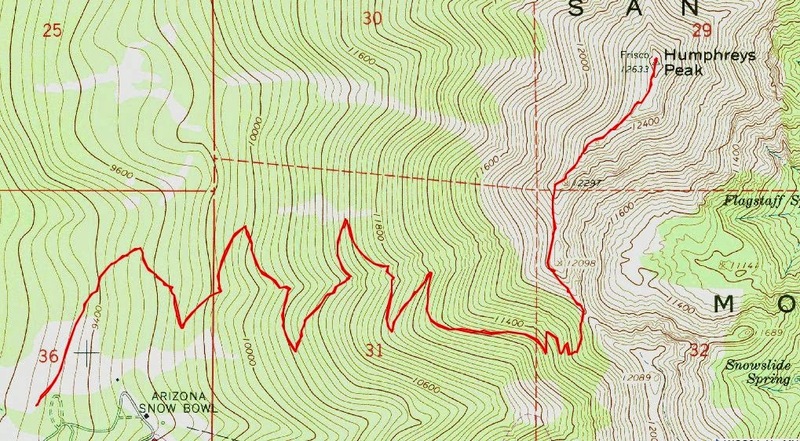 It is relatively straight for .6 miles before beginning a series of switchbacks, as can be seen in the map below. Once we got up to about 11,000', we were greeted with the sunshine and views from some boulder fields. It took us 2 hours to climb up to the saddle on the ridge at just under 12,000'. From the saddle to the true summit is under 1 mile long and there are continuous view from the open rocky ridgeline. From the saddle you get your first view up the ridgeline although false summits block the view of the true summit at this point. We found the ridgeline portion of the hike to be pleasant and not really difficult at all. We were enjoying perfect weather and had no issues with the climb. It took us an hour to climb the ridge, for a total time of 3 hours to the summit. The weather was so perfect we stayed on top for about 45 minutes, which is much longer than we normally do. I little while after we got there a man from South Carolina joined us at the top and a man from Flagstaff, who, although he lived nearby, he had never climbed the peak before. He was enjoying the day, as we all were. While on top, I signed the summit book and we had some sandwiches. It wasn't even 10 AM yet. On the way down, we passed about 20 different groups heading up. We had started so early that we had enjoyed a head start on everyone. The way down was easy but getting warmer. We were glad we climbed in the early morning and didn't have the warm sun on us while we climbed. Leesa was glad we did this peak. It wasn't nearly as difficult as she thought is was going to be. Once we reached the bottom, it was time to head for Phoenix to wrap up our vacation and fly home. It was 100 degrees in Phoenix at the time we flew out! We had enjoyed an amazing 10 days touring and hiking through Colorado and Arizona. A grand adventure.